Dean L. May, Professor of History at the University of Utah in Salt Lake City, has taught as a Fulbright Guest Professor at the University of Bonn, Germany, and Ain Shams University in Cairo. He is a Fellow of the Utah State Historical Society, has served as chair of the Utah Board of State History, is past editor of the Journal of Mormon History, and is the immediate past president of the Mormon History Association. On several occasions, he has received awards for professional and teaching excellence. 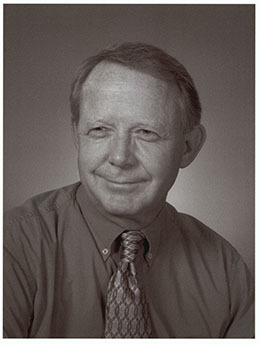 His publications include Utah, A People’s History and Three Frontiers: Family, Land, and Society in the American West. A presentation of the Juanita Brooks Lecture Series1, Dixie State College of Utah—20th Annual Lecture, March 19, 2003. In 1854 George A. Smith was appointed to replace Willard Richards as historian of the Latter-day Saints. He seemed mightily relieved to report to Franklin D. Richards that “The burden of presiding over the southern country in this territory was rolled off my back at Conference. And I can assure you that I felt something like John Bunyan’s Christian is supposed to have done when he got rid of the burden of his sins.”2 But of course, the tall, portly apostle rejoiced too soon. Sins are more easily shed than ties to southern Utah. He bore part of the burden of mentoring the Mormon settlements in the south until the end of his days. Indeed, the illness that led to his death is attributed to a cold contracted in Beaver on his way north from a visit to St. George during the winter of 1874-75. His 1854 calling simply multiplied burdens—adding church history to his ongoing role as overseer of southern settlement. The two tasks were not unrelated as we shall see. George A. Smith (as he is known to distinguish him from his grandson, the church president George Albert Smith), was a first cousin and confidant of the founder of Mormonism, Joseph Smith. He was converted to the faith in 1832 at sixteen and was aide-de-camp to Smith on Zion’s Camp, a quasi-military expedition that in 1834 trekked from northern Ohio to central Missouri intending to help reinstate Mormons on lands taken from them in Jackson County. He was just twenty-two when he was ordained an apostle on April 26, 1839, at the temple site in Far West, Missouri. The previous July, prior to their being driven from Missouri, Joseph Smith had received a revelation that the apostles should begin an overseas mission from that site on that day. They accordingly met there in the early morning hours at the peril of their lives, young George among them. In consequence, he was among the Twelve who that year made their remarkably fruitful missionary journey to England. This was St. George, the colorful, contradictory man who in 1861 was honored in the naming of Brigham Young’s southern capital. My first acquaintance with George A. was in the 1970s, when, almost exactly a century after he was released as church historian I was working for his successor, the church historian Leonard J. Arrington. While researching for Building the City of God, a study of Mormon communalism, I came across the personal journal Smith kept when heading up the first colonizing mission to southern Utah in 1850-51. Perhaps that mission caught my attention because my mother’s parents were both born in Parowan of the 1870s and my mother remembered a brief period when her family lived there in the 1920s as one of the high points of her youth. Whatever the reason, I was fascinated by the insights into Mormon colonization his record of that pioneering enterprise left us. And, in addition, I was fascinated by the man, and wanted to know more of his character and life. I was diverted from that endeavor by an offer of employment at the University of Utah. 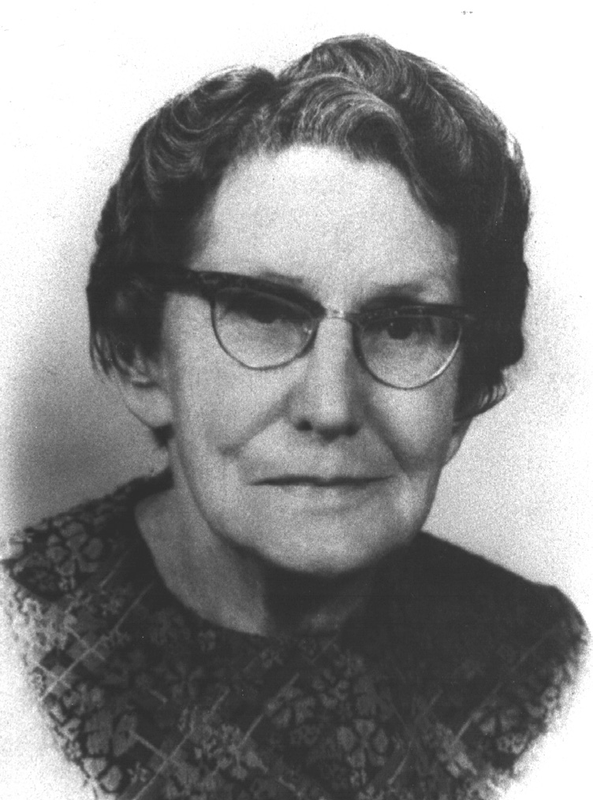 Now, thirty years later, I am delighted that Obert C. and Parowan-born Grace Adams Tanner in endowing the Juanita Brooks lecture, have encouraged me to reopen the quest. Here, I focus on George A. Smith’s roles as church historian and father of the southern settlements. Mormon leaders were quick to follow up. On July 27th, 1850, barely a month after its founding, the Deseret News carried an announcement, seeking volunteers to plant a colony in the Little Salt Lake Valley of southern Utah, “there to sow, build and fence; erect a saw and grist mill; establish an iron foundry as speedily as possible; and to do all other acts and things necessary for the preservation & safety of an infant settlement among the indians.”7 Volunteers were to report to Willard Richards, General Church Recorder (the then church historian) or to Thomas Bullock, who worked in Richards’ office. In any case it is clear that by October Young had chosen George A. to head up the mission. He was a young man, in his 33rd year. He was married to six wives, and had fathered eleven children, only four surviving infancy. Four of his children died during the trials of the exodus from Nauvoo in 1846 and 1847. He had brought his wives and remaining four children to Utah the previous autumn, arriving late in October from Council Bluffs. Perhaps the church president’s choice is a measure of how much importance he attached to the enterprise. He knew George A. intimately and there was a close bond between them. They had met soon after the Smith’s moved to Kirtland, Ohio in 1833. They both took part in Zion’s Camp. They had worked together on the Kirtland Temple, in opening the British Mission, in building up Nauvoo, in the pioneer journey to the Salt Lake Valley and in the formal designation of Young as Joseph Smith’s successor. In all this George A. had never wavered in his faith or loyalty to the leadership of Joseph Smith or Brigham Young. He was described by Young years later as “God’s footstool,” a metaphor that suggests rock-solid reliability, perhaps even relaxed comfort, and willing subservience.9 Smith was a person Young could trust to give his utmost to the vitally important task of pioneering for the Iron mission, but more generally, of opening and overseeing settlements to the south. By Sunday the 29th they were in the Pahvant Valley, site of present Fillmore, which they felt was extensive enough for large settlements if there were enough water. Smith was not feeling well, but in the evening they had services which he described. Our Camp in this snowy Desert presents quite a lively appearance, a number of Camp fires made of dry ceadar surrounded by Companies, variously engaged, some listening to Violins, Accordians, Hymns, relateing anecdotes, Calling of Guard etc all serves to create a pleasant variety. The perfect good humour which prevails and good health in the Company, notwithstanding the severe cold and deep Snows which we have had to encounter whilst passing over high Mountains which would be no small obstacle even in summer, is really remarkable. The group had decided that houses were to be lined up to form a fort-like enclosure. However the two Johnson brothers, Sixtus and Nephi, ancestors of my equally independent-minded wife, Cheryll, had built their house off the line. On March 16th, a self-appointed crew began to rectify the structure when the Johnson brothers stormed out with guns in hand, threatening to shoot the first person to touch their logs. Smith, resting in his wagon, heard the threats of shooting, ran out half dressed, grabbed one of the boys by the collar, reprimanded him severely, and threw him to the ground, “telling him and the others at the same time never to be heard threatening to shoot again.” John D. Lee concluded “This circumstance though unpleasant taught the company to understand that caution & reflection were the parrents of safety & some times a smawl matter kindleth a great fire. A few nights after the same house was put on the line by request of the Pres.”21 Two days after the incident Smith confided in a letter to his wife, Bathsheba, “I am like a father of a Big family here for all Call on me for advice and I give it. I am sometimes fractious and get irritated and then I repent.”22 On June 27th Smith learned that his wife Sarah Ann, mother of his son, John Henry, had died of consumption two weeks earlier. By July 4th the founding had been accomplished. There was a settlement in place, surrounded by fields of ripening wheat. Smith noted with no apparent awareness of their remarkable accomplishment, that there had been no rowdiness in celebrating the national holiday. “All was silent, not a gun fired, or a drunken man seen in the Streets.”23 He remained to supervise the selection and survey of a site on Coal Creek for the Iron settlement which became Cedar City. In November of 1851, however, having provided a home there for his wife Zilpha, pregnant with her third child (the previous two had died in infancy), he left the settlement, and though making frequent visits, was not thereafter a permanent resident of this or any other southern town. Historians take pride in telling the story of the past honestly, warts and all. Indeed, distortions of the historical record, whether to praise or condemn, vitiate what we might learn from history. And, I confess, I am a little embarrassed, in reviewing Smith’s role as a colonizer in this mission, not to have found more warts. Perhaps this helps us understand better why Brigham Young valued him so much and made him henceforth steward of all the colonies southward. Given the cultural imperatives that were fundamental to the Mormon world of that time, a rather important qualification, as we shall see, he truly was a Saint. In March 1854, shortly before the formal end of the Walker War, Willard Richards, who had served both as second counselor to Brigham Young and church historian and recorder, died. Young chose Jedediah M. Grant to be his new counselor, but asked Smith to be church historian. At the time this was no minor task. The church historian was also the church archivist, assembling records and documentation not only for the past but for present church activities. The assignment did not, as Smith hoped, clear him of his southern Utah stewardship; in fact it greatly amplified it. He became responsible for monitoring the progress of, and collecting data from all the settlements, and with Brigham Young as church president and governor, both for the church and for the territory. Perhaps, most importantly, he took very seriously his task of teaching the youth and the growing tide of incoming converts from Europe the sacred story of Mormonism’s founding. Thus the church historian of Smith’s time was not a cloistered reader of dusty tomes, but central and critical to the mission of building the Mormon Kingdom of God. His forte however, was the history of the Latter-day Saints. Nearly every one of his sixty-one sermons for which we have the complete text brought up some aspect of the Latter-day Saint past. Here, his remarkable command of names and dates was amplified by his nearly always being able to give a vivid first-person account. He had been converted as a youth just two years after the church was founded. He was Joseph Smith’s first cousin and an intimate of Brigham Young. He had witnessed and participated in all the crucial events of the early church since his conversion except for the march of the Mormon Battalion. For the burgeoning body of youth who did not remember those events, and for the thousands who had recently embraced the faith, he was the living branch into which their new self-understanding was grafted. The faith stories of New York, Ohio, Missouri, and Illinois became as important as those of their personal lives in Lancashire, Copenhagen, and Gothenburg. Smith, as church historian, helped tie them to their new history and thus their new identity. Many other sermons related historical events more directly. Yet, as is evident here, he skillfully used the early history of the church to teach object lessons relevant to present circumstances. He did so in a manner calculated to evoke an emotional response that acquainted Saints with their history while reinforcing group identity and distrust of those outside the faith. His sermons recounting persecutions and the failure of the United States government to protect the Saints were especially strong during the Utah War of 1857-58, the Civil War of the 1860s, and the beginnings of the anti-polygamy campaign in the 1870s. While on his recent trip to Washington Smith had “told Mr. [Senator Justin] Morrill of Vermont,…that it was utterly impossible by law to change men’s opinions. If a man believes a thing, you may whip him, and he will believe it still.” He reinforced the point by telling of a lady “down in the country, where men have but one wife,” who angered her no-account husband by calling him lousy, or in the language of the time, “cracklouse.” Determined to force her to recant he repeatedly pushed her under the waters of a nearby river and each time she came up for air she shouted “cracklouse.” Finally, in his anger he held her under too long and she drowned. But “she came with her finger nails clenched,…in the position required for cracking a louse.” He related to the congregation inflammatory rumors that the government “plan is deep, and it is laid with the intention of murdering every man that will stand up for ‘Mormonism,’” and concluded with a testimony of his faith. Brethren and sisters, I am a Latter-day Saint, and I know that this is the people of God; I know that this people have the Priesthood, and that Brigham Young is as much an inspired man as was Moses or any other man that ever lived upon the earth. Apparently, the church historian felt there could be no better way to prepare the Saints for the crisis ahead than to ground them once again in the story of the origins of their faith. And in the course of doing so, he reminded them of what the early Mormons had endured, the futility of the government’s trying to change their beliefs by force, and the necessity at times to fight to defend against persecutors. And even with tensions taut as bowstrings he inserted a bit of humor here and there. Smith’s recorded sermons of the period were given mostly in Salt Lake City. They are unquestionably polarizing, reminding the people again and again of the persecutions the faith’s founders had endured, the hostility of the outside world and its clergy, and of the Saints’ innocence and moral and religious rectitude. These recorded sermons represent only a fraction of his entire discourse to the Mormon people. He often began his Salt Lake sermons by explaining that he spoke rarely there, as so large a congregation required more strength of lungs than he was able to muster, but he had spoken to dozens of congregations in the settlements. Smith’s sermon was given on September 13, two days after the thing he dreaded most, as yet unbeknownst to him, had happened at Mountain Meadows. But my point here is that Smith’s role in teaching the incoming Mormon converts of their peoples’ past, his role as church historian, was by no means trivial. In 1860, four years after Smith became church historian, 55 percent of the whole adult population of Utah was British-born and another 13 percent Scandinavian. Altogether 74 percent of those above the age of 15 were foreign born. By 1870, the year Smith was released from his official historian duties, some 67,000 had traveled overland to the Mormon Zion, most of them converts to the church from Europe.38 They came with hearts and minds open and receptive to the teachings of church leaders. Through his role as church historian, George A. Smith taught them the sacred story; of visions, gold plates, persecutions, martyrdom, flight, and final refuge in the West. All these elements were consistently part of his story, but the crucial years of 1857-58 elevated the persecution theme and gave it immediacy for the 40,000 who had come to Utah during the previous decade. While many church leaders dwelt on similar themes, there is but one who may have done as much as Smith to help implant indelibly the idea of unjust persecution in Mormon folk memory and consciousness. That was C.C.A. Christensen, who, later in the century, painted the famous Mormon Panorama, some 23 large canvases that depicted important scenes in church history. They were the cinema of their time. Christensen took them from town to town, rolled on giant spindles, his assistant revealing each canvas to the admiring eyes of the audience as he read the story of the Mormon past. Christensen had come to Utah as a handcart pioneer, and thus was there during the crucial 1857-58 years, very possibly learning his history from sermons of George A. And canvas after canvas presented memorable scenes of the persecutions the predecessors in the faith of Christensen and his audiences had experienced. I was recently asked by a reporter for the Salt Lake Tribune, doing a story on the Main Street Plaza controversy, if the Mormons do not have a persecution complex. I replied that if the notion implies that Mormons imagine others to be their enemies, that their sense of persecution is all in their heads, they do not. They have been, and indeed continue to be, persecuted. It reminded me of the old story of the psychiatrist who gave to a patient the good news that he did not have an inferiority complex; the bad news was that he was inferior. The Mormons do not have a persecution complex; they have been persecuted, and to an extent far exceeding that of any other religious group in the United States. The Utah War occurred just as southern settlement below the rim of the Great Basin was in its infancy. In his sermon of September 13, 1857 Smith spoke promisingly of efforts to grow cotton, madder, and indigo along the Virgin River. The war, in fact, had stimulated the settlement of Dixie, the recall of the San Bernardino Saints bringing back to Utah many who were accustomed to warmer climates and happy to settle along the Virgin. George A. had a continuing interest in Washington County settlement, and soon he began to make the settlement of St. George part of his sacred history of the Mormons. Smith’s role in the early settlement of Dixie is well-known in southern Utah.39 As I noted above, he and Erastus Snow were looking to open settlements over the rim of the Great Basin as early as 1853 when some fifteen families already were located at John D. Lee’s Fort Harmony. By 1857 there was a string of infant settlements up and down the Virgin and up the Santa Clara River which he visited that August. In 1857 he named a settlement up the Santa Clara “Gunlock,” after William Hamblin, who was known as “Gunlock Will” because of his hunting prowess. Smith was chosen that year to represent Washington County as “councilor” (senator) to the territorial legislature. He oversaw the 1858 mission to raise cotton at Tonaquint under Joseph Horne. Horne, like John D. Lee, had been with Smith when settling Parowan. Horne and his crew produced 575 lbs. of cotton and 160 gallons of molasses that season. Smith continued to be deeply involved in colonizing below the rim of the Great Basin. He and Amasa Lyman were in Toquerville on the 10th of August 1858, confirming the appointment of Joshua T. Willis to preside in the settlement. James G. Bleak recorded, “There had been a destructive hail-storm this summer; but the Apostles…encouraged the pioneer settlers and promised them that the settlement would become very fruitful, and they should be prospered.”40 Smith and Lyman chose and ordained church leaders in Toquerville, Washington, and Santa Clara. In July 1859 they “attended the celebration of Pioneer Day at Washington, and in the after part of the day visited and rejoiced with the people at Santa Clara.”41 Perhaps the most searing of the many personal tragedies in Smith’s life took place in November, 1860, when his son and namesake, George Albert Smith, Jr., just eighteen, was killed in the south, across the Arizona border, by Navajo while en route with Jacob Hamblin to a mission among the Hopi people. The word of the Presidency is brethren, it is necessary to strengthen the southern border of our thriving Territory and this is for the general good of all. Many have wondered why a Mormon town would be named for a saint, indeed for the patron saint of Great Britain and slayer of dragons. The answer is, of course, that Mormonism in its quixotic and literalistic way, was not content to reserve sainthood just for those few whose lives were of transcendent virtue and through whose name others have received divine assistance. Audacious as it sounds to traditional Christians and Muslims, all Mormons are, or aspire to be saints, the very name of the church underscoring the point. Still, of the four hundred ninety-seven settlements made by Mormons between 1847 and 1902, only nine were named for a saint in the St. George manner, and St. George was the first of these. They include St. Charles, Idaho, settled three years later, in 1864; the short-lived St. Thomas and St. Joseph, Nevada, both named in 1865; St. John, Idaho in 1867; St. John in Utah in 1873, St. Joseph, Arizona in 1876; and St. Johns, Arizona in 1880. Of all these the only namesakes we know for certain were Joseph Smith, for whom St. Joseph Arizona was named; George A. Smith; David Patten Kimball, who earned his sainthood by heroically helping to rescue handcart pioneers in 1856; Charles C. Rich, for whom St. Charles, Idaho was named; and Bishop John Rowberry, after whom St. John, in Tooele, County, Utah was named. Of course, the two Smiths, Charles C. Rich and even David Kimball, were heroic figures to whom most Mormons would concede special status. Bishop Rowberry would seem the only rank and file saint for whom a town was named, though perhaps there is a story there yet to be told. The Mormon practice of naming towns in this way lasted only nineteen years between the founding of St. George and St. Joseph, Arizona.44 Alas, we will never know whether there was a look of reverence or of playful impishness on Brigham Young’s face when he named St. George. He was capable of both. That October he expressed his gratitude at how unenviable “these mountain deserts” are for no one will covet them. “When we lived on the rich fat lands of the Mississippi and Missouri valleys, our fields and improvements were coveted.” But in Utah the mountains and deserts, “shelter us from our enemies.” The Saints, he said, are like the fox in the brambles. “Though the thorns tore his skin a little they kept off the dogs.”47 The addendum that henceforth was added to his ritual telling of the history of the Saints was their heroism in making the desert blossom. In fact most Mormon settlements were made in reasonably well-watered valleys.48 But George A. eloquently and persuasively generalized the Dixie experience to the entire region, a theme that has endured in the Mormon self-understanding. On Wednesday, Sept. 1st St. George and Southern Utah Settlement received telegraphic words that our beloved George Albert Smith departed this life at 8:40, this morning at Salt Lake City. It was a numbing loss. Yet Smith’s legacy endures. As with its namesake, the girth of present St. George seems uncontainable, extending across the deserts and up over rimrocks in ways that might startle, perhaps dismay, the man who loved this country so much. There is perpetuated among Saints around the world, among millions who may never visit Dixie in their lives, a powerful folk memory of the Mormon past—of trials and persecutions, of mobs and flights, of wresting life and new beginnings from desert places, and of divine redemption—all, perhaps far more than we have understood, a legacy of St. George. This essay was written for the Juanita Brooks Lecture given at Dixie College March 19, 2003. I would like to thank Obert C. and Grace Adams Tanner for the endowment making this lecture series possible, Douglas D. Alder, for inviting me to join the list of distinguished Juanita Brooks lecturers, and Douglas D. and Elaine Alder for their helpful suggestions and careful proofing of the text. And finally, I pay homage to Juanita Brooks, a person and scholar of character, commitment, and courage. She was an inspiration to us all. George A. Smith to Franklin D. Richards, Letter printed in Latter-day Saints’ Millennial Star, Sept 16, 1854. 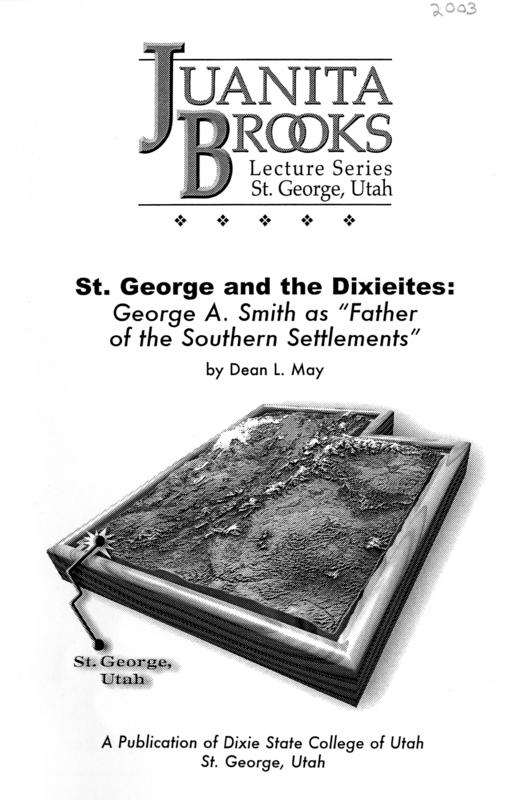 Charles Kent Dunford, “The Contributions of George A. Smith to the Establishment of the Mormon Society in the Territory of Utah,” Ph.D. Diss., Brigham Young University,1970), p. 58. Though there are many original sources relating the life of George A. Smith, including diaries he kept, and memoirs published by himself and his wife Bathsheba in church periodicals, the secondary literature is surprisingly sparse. It includes principally, Merlo J. Pusey’s Builders of the Kingdom (Provo, Utah: Brigham Young University Press, 1981), a biographical overview of the life of George A. Smith, his son John Henry Smith, and John Henry’s son, the church president George Albert Smith. There is in addition Ray Haun Gleave, “An Effect of the Speaking of George A. Smith on the People of the Iron Mission of Southern Utah,” MA thesis, Brigham Young University, 1957; Reid L. Merrell, “Utah Colonization Period Supervised by George A. Smith,” MA Thesis, Brigham Young University, 1966); and the Charles Kent Dunford dissertation previously cited. Brigham Young to Orson Pratt, March 9, 1849 in Journal History, Church Archives, Church of Jesus Christ of Latter-day Saints. The Journal History is essentially a day-by-day scrapbook of a variety of documents from many sources compiled over decades by clerks in what was then called the historian’s office of the church. In William B. Smart and Donna T. Smart, Editors, Over the Rim: The Parley P. Pratt Exploring Expedition to Southern Utah, 1849-1850 (Logan, Utah: Utah State University Press, 1999), p. 179. Deseret News, July 27, 1850. Parley P. Pratt, Jr. ed., Autobiography of Parley P. Pratt, 6th Edition (Salt Lake City: Deseret Book Company, 1964), p. 370. Brigham Young to Alfales Young, September 2, 1875 in Dean C. Jessee, ed., Letters of Brigham Young to His Sons (Salt Lake City: Deseret Book Company, 1974), p. 219-20. The official record (Camp Journal) was kept by John D. Lee and published as Gustive O. Larsen, ed. Utah Historical Quarterly 20 (1952), pp. 109-34; 253-82; 353-83. The quote is from pp. 116-17, the count from p. 122. Smith’s private journal, kept for him by Henry Lunt, is in the LDS Church Archives, and is presently being prepared for publication by Michael Cotter and Dean May. It will here be referred to as the George A. Smith Mission Journal (GAS Journal), the “mean man” quote above being from the entry of December 15, 1850. In quoting from the two journals I left spelling and grammar as in the original. The mission is described in detail in Morris and Kathryn Shirts’ A Trial Furnace: Southern Utah’s Iron Mission (Provo, Utah: Brigham Young University Press, 2001). GAS Journal, December 16-18, 1850. Journal History, May 19, 1852. Pusey, pp. 86, 127. Camp Journal, pp. 124-25; GAS Journal, December 22, 1850. GAS Journal, December 26, 1850. GAS Journal, December 29, 1850. Camp Journal, pp. 131-32. GAS Journal, January 10, 1851. GAS Journal, January 31, 1851. GAS Journal, February 20-21, 1851. GAS to Bathsheba Smith, March 18, 1851, George A. Smith Papers, LDS Church Historical Department. GAS Journal, July 4, 1851. GAS Journal, November 5, 1851. Journal of Discourses, 26 vols. (Liverpool: Latter-day Saints’ Book Depot, 1855-1886), I: 79-81. Deseret News, December 8, 1852. James G. Bleak, Annals of the Southern Utah Mission, Book A, , Typescript LDS Church Archives. James G. Bleak was clerk and historian of the Southern Utah Mission, called to settle the town of St. George in 1861, and carefully kept records of the enterprise which were later incorporated into his “Annals,” the importance of which as the core source of the nineteenth century history of the region can not be overstated. Journal of Discourses, I: 191-97, esp. 196. Journal of Discourses, III: 28-37. B. H. Roberts, ed., History of the Church of Jesus Christ of Latter-day Saints, 7 vols. (Salt Lake City: Deseret Book Company, 1932), V: 391, known commonly as the Documentary History of the Church or DHC. Apparently referring to the 12th century Italian jurist, Franciscus Gratianus, known as Magister Gratianus, or Gratian, founder of the science of canon law. Journal of Discourses, III: 23-28. Journal of Discourses, III: 280-91. Journal of Discourses, V: 101-11. Journal of Discourses, V: 359-67. Journal of Discourses, V: 221-25. Data collected by the author from the manuscript US Census for 1860; from John Unruh, Jr. The Plains Across: The Overland Emigrants and the Trans-Mississippi West, 1840-1860 (Urbana and Chicago: University of Illinois Press, 1982), pp. 84-85; and from the 1997-98 Church Almanac (Salt Lake City: Deseret News, 1998), pp. 174-76. The history of Washington County settlement is well covered in Douglas D. Alder and Karl F. Brooks, A History of Washington County (Salt Lake City: Utah State Historical Society and Washington County Commission, 1996. See also Andrew Karl Larson, I Was Called to Dixie: The Virgin River Basin; Unique Experiences in Mormon Pioneering (Salt Lake City: The Deseret News Press, 1961). Bleak, Book A, pp. 31-44. Bleak, Book A, p. 52. Journal of Discourses IX: 200-203. I derived the data for town naming from the appropriate entries in Andrew Jensen, Encyclopedic History of the Church of Jesus Christ of Latter-day Saints (Salt Lake City: Deseret News Publishing Company, 1941). Journal of Discourses XI: 157. Journal of Discourses XI: 360. Journal of Discourses XII: 6-10 (mistakenly paginated in printing as pp. 381-85). Geographer Richard H. Jackson has written persuasively on this theme. See especially his “Myth and Reality, Environmental Perception of the Mormons, 1840-1865, an Historical Geosophy,” Ph.D. diss., Clark University, 1970. More accessible is “Mormon Perception and Settlement,” Annals of the Association of American Geographers 68, no. 3 (1978): 317-34. Bleak, Book A, p. 310. Bleak, Book B, p. 126. See Leonard J. Arrington, Feramorz Y. Fox, and Dean L. May, Building the City of God: Community and Cooperation Among the Mormons (Salt Lake City: Deseret Book Company, 1976; 2nd ed., Urbana and Chicago: University of Illinois Press, 1992). The quote is from Bleak, Book B, p. 210. Bleak, Book B, p. 374. Bleak, Book B, p. 425. Brigham Young to Alfales Young, September 2, 1875 in Letters of Brigham Young to His Sons, pp. 219-20.